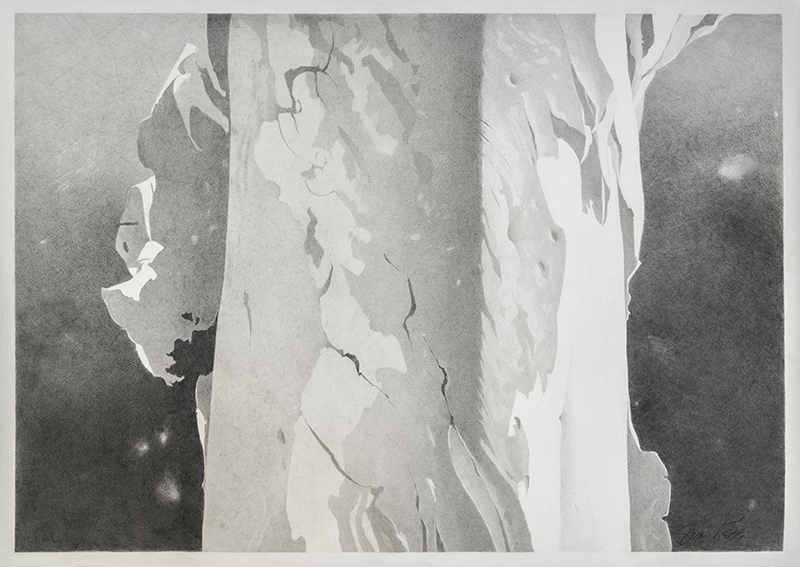 Marcia Burtt Gallery presents “Susan Petty: Explorations,” drawings of eucalyptus and sycamores that examine substance and space. Departing from her colorist origins, Susan Petty has worked primarily in graphite for eight years. With this series she culminates her exploration of decay and transformation through the simple medium of graphite. Petty uses trees in their shedding phase to represent figurative change. She delicately renders deciduous layers of peeling bark on sections of trunk and limbs, letting old and new define each other by creating amorphous boundaries and mysterious interstitial shadows. Focusing on the tree’s skin rather than on its structure parallels Petty’s attention to the paper’s surface. Using layers of crosshatching she creates textured deep space behind the tree fragments. The tree itself is formed largely by unmarked paper bordered by darker shapes of bark. Behind, where the crosshatching doesn’t quite mesh, points of light create constellations in space. The resulting images are otherworldly landscapes based on two of our favorite worldly species.